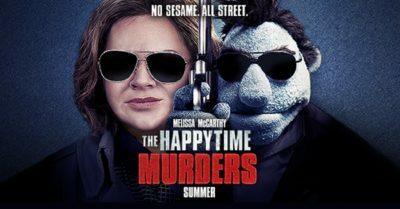 The Happytime Murders is a movie that takes an interesting twist on our relationship with puppets, then takes that twist and beats it like the dead horse that it is. The movie follows ex-detective Phil Phillips on his hunt to find the person responsible for the killing of his brother’s ex-castmates of the Happy Time Gang. The main issues come with the movie’s pacing and its comedy. The plot basically begs you to take your idea of puppets and tries to make it as edgy as it can. Though it doesn’t take into account the fact that the demographic that it’s attempting to appeal to has the internet. Audiences have seen such obscene, raunchy material for quite a while and having puppets getting mauled by dogs or puppet prostitutes just isn’t that out of the ordinary. Nor is it that funny when a puppet starts swearing out of nowhere when we’ve had films like Sausage Party coming out and erasing expectations on cartoons being kid friendly. Shows like Rick and Morty, Final Space, BoJack Horseman, and countless others show that they can use cartoonish imagery in order to show adult themes. So when people watch The Happytime Murders continuously beat you over the head with the fact that these are puppets who don’t act like puppets should, the shock value is gone in the first five minutes of the movie. With the comedy, for every kind of funny joke about a certain situation, there’s four more that don’t land and make it awkward for the viewer until the movie eventually moves on. The plot is very predictable with everything happening exactly how you’d expect with absolutely no surprises. Though if the movie is attempting to cater to a more mature, adult audience, then there isn’t a need to continuously throw the theme in our face. A theme is only as effective as how impactful it is towards the characters and the shift that a character must face in order to find the right decision. And that sums up the Happytime Murders, in a nutshell. An in-your-face experience that feels forced, blunt and unappealing with its lack of subtle humour and jokes that don’t cater to the audience that’s watching it.